Shin Megami Tensei IV‘s soundtrack. Damn what a soundtrack that was. From getting hyped by that Boss Theme, to shitting your pants fighting an Archangel, the music of SMT IV was intense and unrelenting. And now you can finally have it! 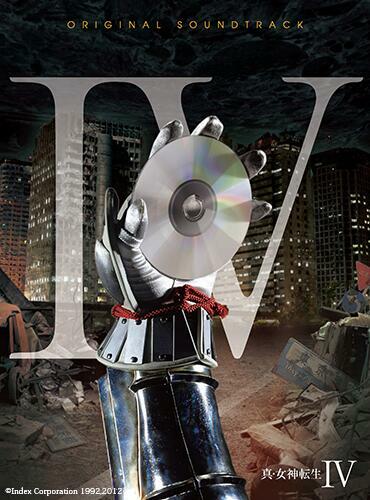 Atlus has announced that the Shin Megami Tensei IV Original Soundtrack is set to release in Japan on February 26, 2014, courtesy of Mastard Records. The music will come in four CDs, complete with kickass cover art (pictured left). If you haven’t gotten the game yet or missed out on the first print, you’re probably wondering what all the hubbub is about if we got the soundtrack already. What came with the game in both the U.S. and Japan wasn’t the soundtrack to the game, but instead an 8-song tribute CD containing updates of older mainline SMT music using modern instruments, save for Nocturne’s prelude which is simply a remix with SMT IV instrumentation. So anyone trying to look for cleaner SMT IV songs on Youtube had one helluva wait on their hands as the songs uploaded there were mainly gamerips — many of which are already compressed to accommodate for space in the game. The music for SMT IV was done not by Shoji Meguro, who took over composing duties after Nocturne, but by Ryota Kozuka. While much of the dungeon music was par for the course for an SMT game, the battle music was much different than Meguro’s stylings. If anything, they were all throwbacks to the older SMT titles, which had a faster pace and killer riffs. Go ahead and have a listen, and compare them to what you heard in SMT IV. It’s pretty cool if you ask me. For any importers out there, it’ll be available for 3900 yen. And again, it’ll be available on Febuary 26 of this year. You can look on the Mastard Records site for full track listings. This entry was posted in Gaming News and tagged Atlus, MegaTen IV, Music, ost, Ryota Kozuka, Shin Megami Tensei IV, SMT 4, SMT IV on January 16, 2014 by Steven T..